I just finished a new collection of handmade art earrings and I’ve fallen in love with them. I feel like this is my most beautiful collection yet. The designs inside the earrings are amazing Turkish gilded artwork that I found while wondering around inside the Grand Bazaar in Istanbul. I matched the different designs up in pairs, then encased the art under glass and fixed them into earrings. I want to give my readers first pick of these beauties – if you see one you love, please reserve at this link in my online shop by Monday evening, November 3rd. Once a pair is reserved, I will take it off the list and there will never be another one exactly like it. The reason for the quick, 2 day only reserve sale is that on Tuesday I’ll be taking the collection of earrings over to the fabulous store, The Local Exchange, located on the Historic Marietta Square in Marietta, Georgia. The earrings (and my Christmas ornaments & Christmas cards) will will be available for the holiday season there starting with their Holiday Open House this Friday. These will be a bit hard to let go of…I may have to give each one a hug goodbye. (I had a moment where I thought maybe I’d tuck them all away in my own jewelry box.) 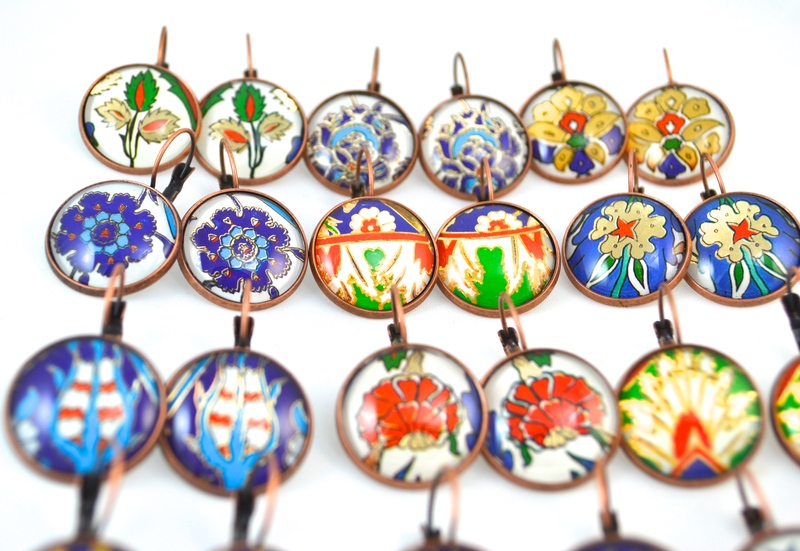 But what I love the most about making art is being able to share it – and sharing these bright, beautiful Turkish artwork earrings with you is a little dream come true.